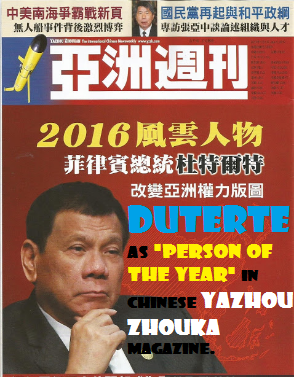 Home China Duterte Executive Government President President Duterte entitled as "Person of the Year" in Chinese Yazhou Zhoukan magazine. President Duterte entitled as "Person of the Year" in Chinese Yazhou Zhoukan magazine. Popular Chinese language magazine has chosen PRRD as "Person of the Year". Yazhou Zhoukan which literally means "Asia Weekly" is the world’s only Chinese language weekly international magazine with circulation in Hong Kong, Taiwan, Singapore and Malaysia. The magazine provides political, economic and cultural news around the world. President Rodrigo Duterte, as we recalled from his recent words against the United States of America. The Filipino people also see his warmed welcome to ties with the Xi JinPing of the Republic of China. After the UN Tribunal verdicts, and favored the ruling to the Philippines concluding China has no legal basis to claim historic rights using a nine-dash line map that covers most of the South China sea, president Duterte's visits to China calmed down tensions brought by the decision. The president told that there is a time for the disputed islands. But for now he will make a distance to avoid war and not to be in-between the two superpower countries, he will not endanger the lives of his countrymen. Xi Jinping welcomed Duterte's visit warmly which resulted to a USD24 billion worth of investments and financing agreements.